The 2016 Native American Dollar represented the eighth annual release within the series celebrating the contributions made by Native American tribes and individuals to the history and development of the United States. 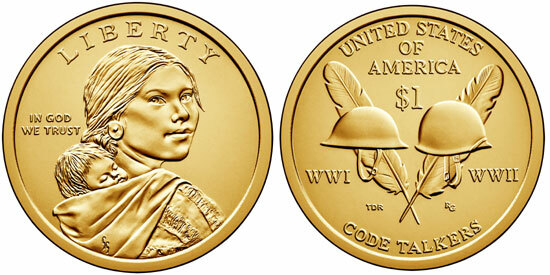 The reverse design for this year highlighted the contributions of the Native American Code Talkers of World War I and World War II. The name “code talker” refers to people who used their native languages as a means of secret communication during wartime. During World War I and World War II, hundreds of Native Americans played a vital role by using their languages as the basis for secret battle codes to communicate troop movements and enemy locations. Although the Navajo Code Talkers from the World War II Pacific Theater were the most famous group, code talkers from 33 different Native American tribes have now been recognized for their important contributions. The reverse design of the coin features an image of two helmets, one in the shape of the helmets used in World War I and the other in the shape of the helmets used in World War II. Behind the helmets are two feathers placed in the shape of a “V” to symbolize “Victory”. The inscriptions include “WWI”, “WWII”, “United States of America”, “Code Talkers”, and the denomination “$1”. The reverse was designed by Thomas D. Rogers, Sr. and engraved by Renata Gordon. On the obverse of the coin is the portrait of Sacagawea designed by Glenna Goodacre, which has been used in common throughout the series. The inscriptions read “Liberty” and “In God We Trust”. The date, mint mark, and motto “E Pluribus Unum” are placed on the edge of the coin. The 2016 Native American Dollars were not released for general circulation, but only struck in limited quantities for inclusion within various numismatic products offered by the United States Mint. On January 27, 2016, the US Mint offered 25-coin rolls, 100-coin bags, and 250-coin boxes of circulating quality coins struck at either the Philadelphia or Denver Mint facilities. Later in the year, a proof version of the coin struck at the San Francisco Mint was included within various annual proof set offerings. Total production for the circulation strike version was reported as 2.8 million pieces struck at the Philadelphia Mint and 2.1 million pieces struck at the Denver Mint. These matched the total production figures of the previous year.